WOULD YOU PAY FOR THEM? The last thing you want to have happen while paying for your groceries is that you are short cash. Not everyone has a credit card to pay for groceries to pick up the perks nor do they care to use a debit card to pay transaction fees where applicable. In fact many people use a cash envelope system to budget their expenses and the grocery budget is included. This means that they carry only a certain amount of money with them when they go grocery shopping. Most times they keep this money in an envelope or a separate area. If you are someone who only carries cash while grocery shopping being short cash at the check-out can be embarrassing for some and for others they simply wave it off as no big deal. Deep inside though we wish we didn’t have to put items back once they are already scanned through. Having enough money to pay for whatever we need at the grocery store is important but not everyone is that fortunate. 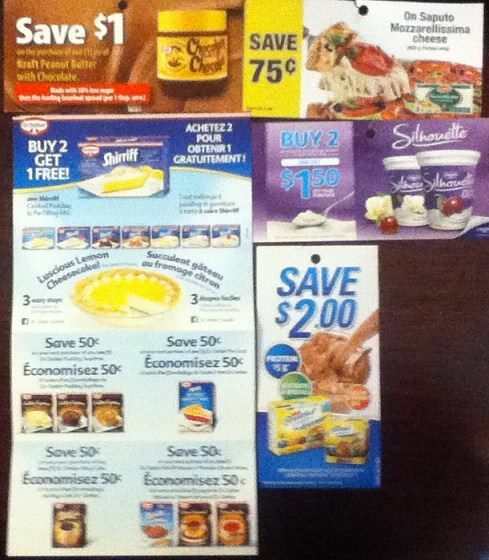 Planning a grocery shop using the sale flyers, coupons and other savings avenues such as Checkout51, Cart Smart and Snap Saves is reality for many people and not just because they don’t have enough money to spend but because they want to save money. The further you can stretch the grocery dollar the better because that means you can buy more of what you need instead of coming up short on cash. To be honest being short on cash can happen to anyone, anywhere at any time. Heck it’s happened to me so many times I can’t even count but it’s for various reasons. Some places don’t accept credit cards, debit cards and only cash for some bizarre reason. I’m sure many of you can think of places that say their machines are always broken and only take cash. I often wonder how much of their sales gets declared to the tax man. For many cash is King and that means they never leave home without it or they make that special trip to the bank to remove cash from their bank account or take advantage of cash back at various stores. 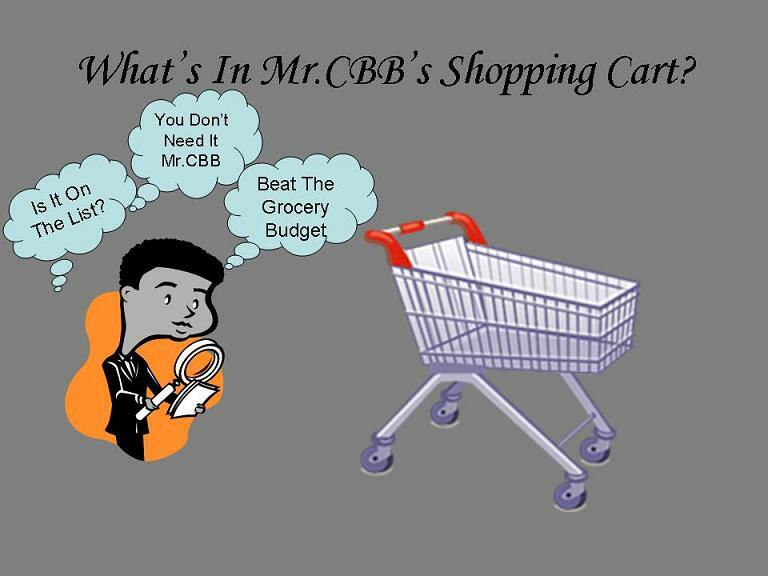 What happens if you are grocery shopping with cash, no debit or credit card and the cashier tells you that your order is $65.00 yet you planned your grocery shop according to your list to ring up at $60.00? It happens and I’ve seen it happen before where someone is standing in line digging in every pocket imaginable or emptying out their purse in hopes of finding hidden coins or bills. I’ve seen on many occasions customers who are short on cash including myself just tell the cashier to take an item off the grocery bill so they could afford the bill. On the very rare and I mean rare occasion have I seen a customer in the grocery line behind the customer who is short cash speak up and say, “Here, don’t go without I’ll cover the rest for you”. I think it’s amazing that someone would do that for a complete stranger who was short on cash and many people would likely accept and say thank-you. What happens when you have that one customer who says “I don’t need your money I have more than enough I just didn’t bring my purse or wallet with me” and gets upset with you? Some people would actually take offense to this kind gesture observing it as they think they are poor or don’t have enough money in the bank to pay for food. You know you will never win in this situation but do what your heart and head tells you to do. If they will be rude then so be it your gesture was of kind nature just so they didn’t have to return product. I’ve had cases where I’ve offered coupons to a customer because they had the item in their shopping cart and was spoken to rudely. We both love talking to people at the grocery store whether we talk to them first or they talk to us. We always take a minute to see if we will learn something new or help someone else learn something they didn’t know before they went grocery shopping. It’s amazing how many people take pride in success and having money or wanting people to believe they have money and can take care of themselves. 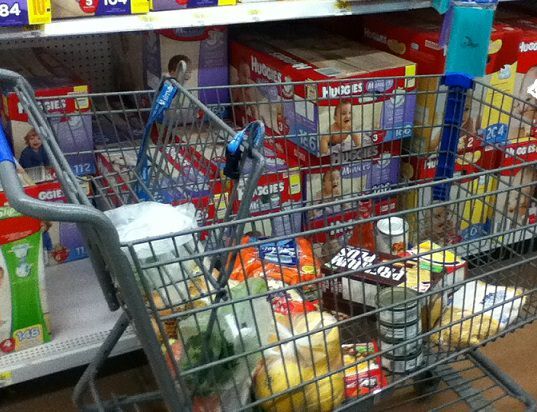 Just last week we spotted a shopping cart at a grocery store filled with pink sticker 50% off items. A little old lady who was pleasant started asking us questions about products. She wanted to know if we tried them and if we thought the prices were good. We happily told her what we thought of the products she asked. Her shopping cart was filled with bottles of Heinz Ketchup with pink stickers. Needless to say she got it all at a great deal. Later on after she checked out and was packing her groceries my wife went over to chat to her and ask how much she ended up paying for the ketchup because none of the products had original prices. She wasn’t sure so she pulled out her receipt for my wife to look at. My wife told her that she got a great deal on the ketchup and the little old lady said her husband would be so happy because he loves ketchup. She asked my wife if we got a bottle because she assumed she took it all. My wife said no and the little old lady offered to give her a bottle for free. For free, that’s right and my wife was a complete stranger. My wife said thank-you to her and she said, thank-you for chatting with me. It’s amazing how if you take a moment to be kind to people you never know what will come out if it. Some people just want to chat and others don’t have a minute to live because they are going at a hundred miles per hour. I believe these people over-think situations especially like the two I explained above and take it from a kind gesture to something way out in left field that leaves others shaking their heads. You try to do something nice but get shot down. Sadly in life that’s the way it goes so keep smiling and live life the way you want to live it. If you want to pay if forward and pay for someone’s coffee ahead of you or help someone out who is short cash do what feels right. If they don’t accept your kind gesture someone else would be more than happy to one day. For me I’d help out as much as I could but to a certain extent. I’m not going to pull out my credit card to pay $100 that a customer is short on cash. If they are short $10 I’d likely have no problem helping them out. I mean it doesn’t happen every day and doing something nice makes me feel good inside especially when I know I’ve made someone else’s day. Hang on to your money and share it with those that clearly won’t mind that helping hand when they come up short cash or simply pay it forward. Have you ever pitched in some money if the customer ahead of you was short cash? How much would you be willing to help out? 2 x Grape tomatoes Sale $0.97 ea. 4 x 2% milk Sale $3.97 ea. 2 x Breyer’s Ice-cream Sale $3.49 ea. 2 x Fleecy Fabric softener Sale $2.88 ea. 2 x spices Sale $0.99 ea. 2 x rapini Sale $1.67 ea. 3 x Bavarian Multi-grain bread Sale $1.99 ea. Weekly Overview: We went over budget this month but no surprise given the Parmigiano Reggiano cheese which was an amazing price at 50% off. We also participated in a Shoppers Drug Mart grocery event where you spend $30 on grocery get $10 in Shoppers Optimum points. The bacon and ice-cream was on sale at Shoppers so we decided to add that to the cart. We don’t normally buy ice-cream but have had enough of this snow and besides a treat is nice once in a while instead of going on to pay for a cone. The cone would likely cost you the price of a tub of ice-cream. We do have 2 $5 Chapman’s ice-cream coupons but one expires in December and the other in 2015 so we have plenty of time to use them up. So after the $10 in points we got back we are actually only over the $10.82 but since we don’t physically have the cash we will treat is as we went over. I usually work out within a couple of dollars how much money I need to have with me (I’ve never paid for purchases with anything other than cash, with a few exceptions of Xmas/Birthday gift cards or very infrequent SDM point redemptions) and as much as I’d like to do more than offer a spare set of hands to help someone with their groceries, reaching a high shelf (I’m a pretty big guy) or far back into one, or let someone in a hurry go ahead of me, I really don’t have any extra money to pay for someone else’s groceries, even a small purchase. I’m on a fixed, relatively-limited budget and while I’m not going to be homeless anytime soon I know how many people who have the mental disabilities I have end up there. It’s what I’ve told more than a few people who’ve asked me for money while I was out and about: I don’t have anything I can spare, and probably won’t anytime soon, but when that changes I’d be happy to. Same goes for here; if one day that kind of financial help is something I can afford to provide sometimes, I would consider it a kindness I could do. Not everyone has spare cash to be handing out so I understand what you are saying. I also believe that being to help others out without spending money is just as rewarding. We are under budget this month but I did order some product that hasn’t come in yet so I have paid for it yet. We ate out a lot while my girl was here on spring break so some of our budget went to that. I have three discount Tuesday shops planned to help with this months budget and stockpile a few items and hoping that I don’t go over budget too much. That sounds like a pretty good deal to me as long as you have coupons too, even better. Here are my shops for the week, I think I will call it a month here and try for 5 weeks in April. One of them has to be 5 weeks and it may as well be April… I was at the drug store and Canadian Tire as you know and those are in here…. So I am under for the month again but not by much. Hopefully I can stay under budget for April and not eat up the carry over too much as I do want to have some extra for June when the boys and I go picking strawberries for jam and eating. As it stands right now I’m good there as it is usually $40.00-$50.00 for all the berries we get over a couple of trips to the farm. Things like the Royale products and the Dove were on sale for nice prices as was the peanut butter. Given how we go through those products I didn’t get enough to really call it stockpiling. By calling this a 4 week month I made it under for the month. April will be a challenge…..
Weekly overview: Well I really need to start watching my math! I thought I had $65 left to spend for this week according to my calculations last week so I panicked at the grocery store today and used a $50 gift card so that I wouldn’t be over for the month. I just finished my calculations for this post and now I’m under for the month by $90!!! What the heck??? It feels like my life is spinning out of control lately and it seems to be reflected in every aspect, even in my grocery shopping. I hope to get all aspects under control soon, before I lose my mind. I know but the excitement was fun lol. I have never had this situation happen to me…but i would definetly offer to help if it was for a few dollars….i would feel awful not to help 🙁 Here is my shop this week! Wow i still made it under budget! So happy didnt think i would! Managed to score some great deals! I have offered customers in line coupons to use periodically or offer to let people price match with the flyers I have for stuff on the belt, it can be a huge savings sometimes. Often giving coupons to seniors, knowing how difficult it can be. I personally couldn’t offer them any money. And, I have in the past put items back if I didn’t have enough. I haven’t done it in some time, but I will be restarting that soon now that I am trying to be as diligent as I was three or four years ago. We got comfortable knowing the money would be there since we’d hit that point, now that security is gone. We go with cash and when it isn’t enough, we won’t buy. I always sorted by the must haves, separated anything else on the belt with a divider and then added things one at a time. However, I find it best to have it added up in my head before I get to the cash to avoid it altogether. I am pleased with this week. We had a few large expenses on the budget like my son’s shampoo and bread since I got behind making it at home. With the shampoo, we tried something new that ingredients looked ok because it was about $10 less a bottle to the other stuff he uses. We researched and decided it was worth the risk of the loss based on the future savings. So far so good, looks like a good investment at this point. We used up a few FPC coupons so they wouldn’t expire at the end of March. And our biggest score was the Driscolls raspberries this week. We could eat many containers without anything ever going bad. I’m hoping to hit up that sale again before it is out of the flyer to price match. I will fill in more of the online surveys to get more Driscolls coupons. We love Driscolls! Mostly basics this time! We don’t make our own shampoo yet, but I have to read and research every ingredient in the bottles of shampoo I buy. My son has far too many contact allergies and many ingredients are the same but go by different names. So far we have to buy organic (that doesn’t have domestic trees products in it) and be careful of fragrance as well as a foaming ingredient called cocamidopropyl betaine. Another reason we like organic is they indicate all of their ingredients individually and don’t just say fragrance. We know which fragrance we can’t buy and anything else is by research. I don’t want to make shampoo yet, but if need be down the road that will be coming. It’s sad that at the age of four my son could say cocamidopropyl betaine. Even at 8 he gets looks and comments of coca what? He takes his own soap with him wherever he goes. And it took a long time for my husband and I to find mass market shampoo we could buy so we didn’t have to bear the expense of the organic for all of us. We do have a small garden each year, but I am expanding this year. We have some strawberry plants, but they have yet to yield anything, I am not sure how to best keep the birds out of them. In that same bed we have asparagus, but I was really hoping they would have been in better condition by now, but we get a bunch each year. They were planted 7 years ago. The rest of it we plant annually. A couple of cucumbers, we did zucchini last year, tomatoes always but last year yielded very little. I started my own plants this year which I haven’t done in a few years. I also plan to build a large planter for the back yard this year since my son has out grown our yard now. The plants we have started are two types of cucumbers, zucchini (which I may replant, only two came up and they aren’t really growing), butternut squash, acorn squash and watermelon and spices for indoors. I usually get tomatoes from my father-in-law, so I’m hoping to do that again this year or I will purchase a few of those plants. We will also be putting in green onions and peas. It’s ambitious this year, but I desperately need to get the food cost down since I don’t know if I will be working by summer. And, we have some farms nearby where I get strawberries and raspberries in bulk that we pick to can or freeze. Not as cheap as growing them, but taste far better than the grocery stores. Raspberry plants are hard to come by here, they’re a fortune, I always look when plants are put on clearance to help get ready for the next year. We devour raspberries and blueberries in our house like they are going out of style. That’s awesome Catherine that you were able to do that for him and that he appreciated that. Ha ha, that’s true mate. Anything to get the line moving after all time is money right? We haven’t paid for any purchases in a grocery store, but we allowed strangers to use our customer appreciation card at IKEA (in Australia) so they can have free coffee. That makes them very happy. In the groceries stores, we always accept the complimentary ‘kid cards’ and then find a family and give them to them, for their kids. We picked up a few things at RCSS this week and I am desperately waiting to make a Costco trip to pick up some dairy products. Next week I guess… I have been rather up to my armpits around here getting things all caught up, cleaned, posted and filed. 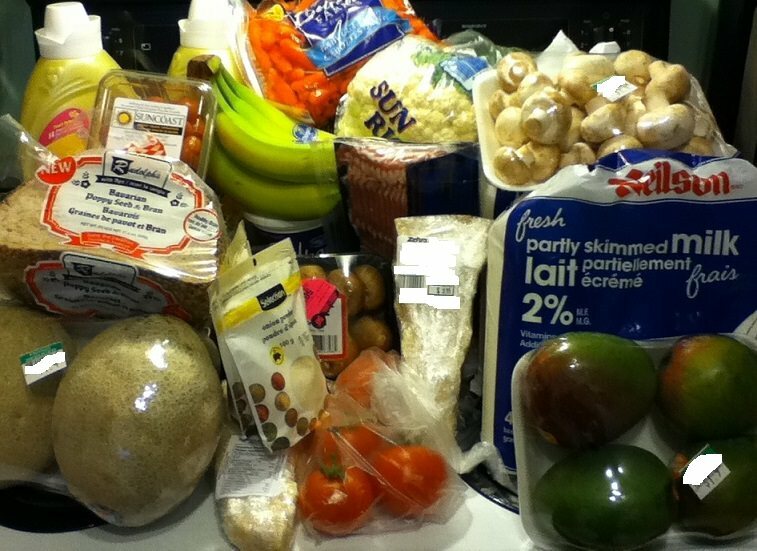 This month is going to be really close with my grocery budget… depends on how much I spend at Costco – I am trying to be good! LOL I have a sneaking suspicion I am going over by a few dollars because I need milk and cottage cheese. We’ll see how far my $8.52 goes at Costco. We constantly make the effort to help others out in situations like this. Not because we are well off, because we certainly are not, but because we know how it feels to not have enough and have to go without! Especially when we are purchasing something that is a “luxury” instead of groceries, like a stop at Tim Hortons for example. We have made it habit to always pay for the car behind us. Not because we think that they can’t pay for it themselves, but A) we treat it like the teachers always said in school, “did you bring enough gum for the whole class?”…if we want to splurge for ourselves, then we better have enough for the car behind us as well! and B) there’s very few things in the world that can brighten someone’s day more than just experiencing true kindness from a total stranger! It’s awful that ANYONE ever needs to go without, and maybe if we all learn to help eachother out now and again people will continue to pay it forward and make the world a better place. Very nice way to live Julia, thanks for sharing that with us.